Large bi-folding doors peel back off the ground floor living spaces to open the home and blur the lines between what is inside and outside. This created a very open and comfortable living and entertaining area. The orientation of the two outdoor courtyards became a key player in the design of this home. If the typical or suggested location to put an outdoor living area was considered (outdoor living to the North) the space would have been in constant shade by the neighbouring home. We challenged this suggested residential design code as being inappropriate for this property and chose to incorporate two courtyards to the south side of the property instead. This decision created a morning sun courtyard to the rear of the home, whilst simultaneously providing an afternoon sun courtyard to the front of the home. The two courtyards ultimately increased flexibility in how one could use the outdoor living spaces of the home whilst also maximising the use of the site. The end result was that we created a continuous free-flowing space from the front of the property to the back, when the bi-folding doors were opened. The strategic planning of spaces, different height volumes, the positioning, size and different types of openings all influence the overall experience of the home. 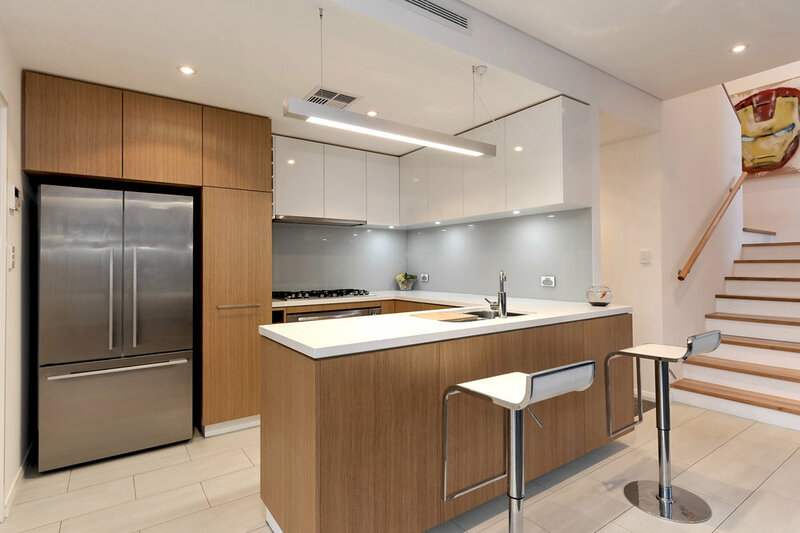 During the day, natural light pours through from all angles to provide a sense of liveliness. The external aesthetics of the home combine a fusion of pitched and flat roof forms to embrace the neighbouring gable roofs from the surrounding house, whilst still looking ultra-modern. 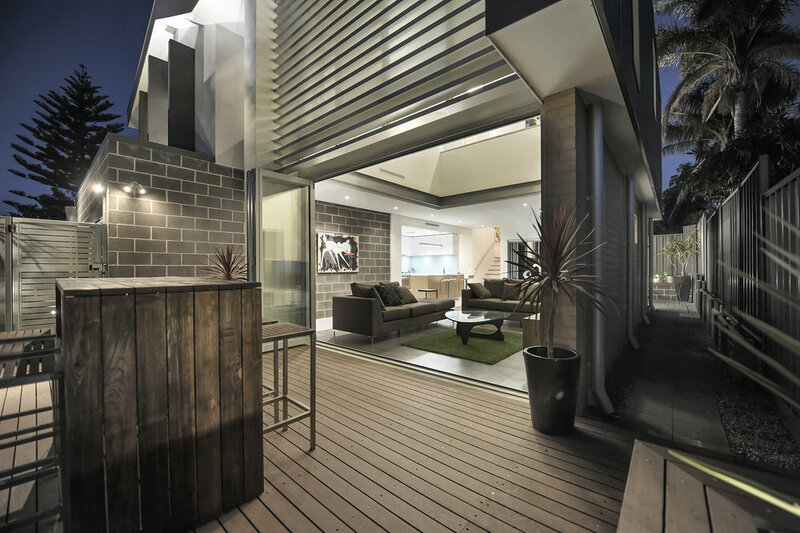 The southern metal clad wall to the upper storey of the home creeps up to become the roof in one seamless transition. A combination of different building materials were carefully selected to meet the thermal performance requirements of the home whilst also considering the longevity of the home. The material pallet is consistent throughout the project and the selections help to animate the spaces. 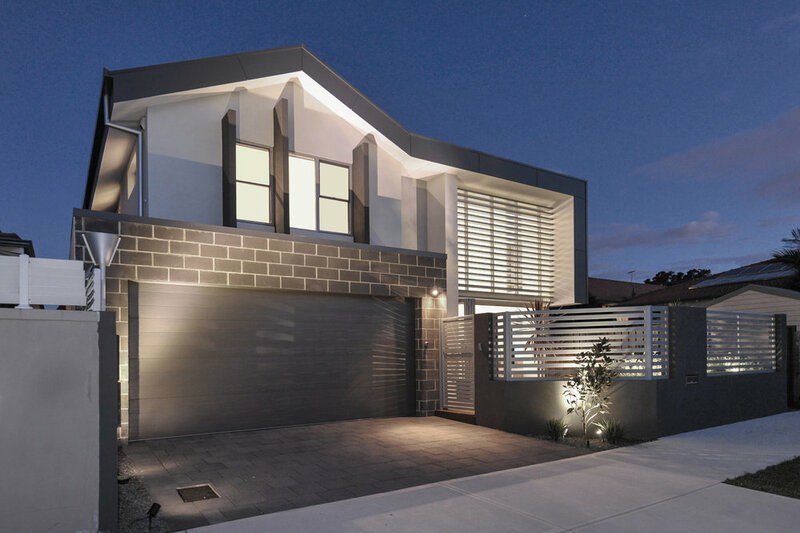 This home incorporates an array of simple, but effective sustainable building principles and is a positive example of how lifestyle wants and needs can be addressed through a considered design process.